There's a story in the Scriptures of a woman whom Jesus meets as He and His disciples passed through Samaria - a city on the way to Galilee. Now [Jesus] had to go through Samaria. So he came to a town in Samaria called Sychar, near the plot of ground Jacob had given to his son Joseph. Jacob's well was there, and Jesus, tired as he was from the journey, sat down by the well. It was about the sixth hour. For those unfamiliar with the tension between the Samaritans and the Jews in the text, it must be noted that the two groups are separated by more than just ethnicity. The Samaritans were of Jewish descent, who later became "impure" on account of their intermarrying with Assyrians and other non-Jewish people after the Assyrian conquest of Israel. The Jews of Jesus' day laid claim to a "clean" bloodline, tracing their lineage back to the tribe of Judah or the priestly bloodline of Levi - these Jews did not intermingle, but kept their traditions and culture in tact, even after the Babylonian conquest of Judeah. Because of the physical divide between the people of Samaria and Judeah, the Samaritans eventually built their own temple on the mountain in Samaria to worship God, whereas "true" Jewish worship (according to the Scriptures) could only be conducted at the temple in Jerusalem. The Jews knew this, and from the Samaritan woman's words, she too understood that the Jews laid claim to both ethnic and religious purity. It's interesting to try to project ourselves into the text. 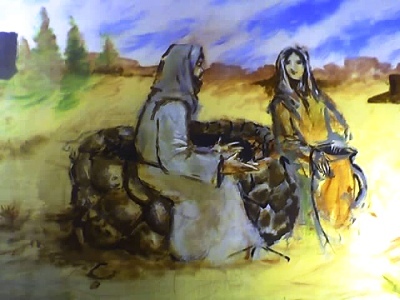 Some people find themselves viewing the story from the perspective of the woman at the well -- rejected by people due to her ethnic background, rejected by society on account of her relationships, carrying the burden of shame. And from that perspective, they see the hand of the Messiah extended to them, offering them living water. I wonder if the text should also be viewed as a cautionary tale for today's believers who, like the Jews of the day, believe that there is only one place appropriate for worship (the temple of their denomination). Perhaps today's believers shun entire groups of people for being impure, and for failing to adhere to established religious rules. And maybe believers today are technically correct, but fail to see the bigger picture of the living water offered by Christ. Jesus' own words: "You Samaritans worship what you do not know; we worship what we do know, for salvation is from the Jews." Jesus affirms that the Jews are "doing it right," and that the Samaritans are worshipping "what they do not know." They're doing it wrong. But Jesus doesn't draft up a 3-point sermon outlining the way in which the Samaritans should clean up their act. He doesn't bring out The Book and spell it out for her. When she says, in her purest cry of faith, "I know that Messiah is coming. When He comes, He will explain everything to us," Jesus declares, "I who speak to you am He." How, then, should belivers view people who call themselves believers, but don't look or act like it? Have we, like the Jews of Jesus' day, become spiritually ethnocentric, believing in error that our way of worship is the only way? Or can we accept that the Samaritan woman's simple act of faith -- a simple statement of belief that the Messiah will come and fix things -- is sufficient for salvation? Believers today are called to worship God "in spirit and in truth." What does that mean in this context? Totally off topic - I'm a bit angry now, but feel completely and utterly impotent in my ability to do anything. Two words - White Phosphorous. Ken - yeah, I hear you. But how does "militants hiding in hospitals" make you feel? Because it's not like there's a good guy in a situation like this. Agreed. There are no good guys, but there are children. Lots of them. I don't think "militants hiding in hospitals" justifies this kind of "collateral damage." Ken - I get what you're saying, and I completely agree with you. But as you probably expect, I'm going to be play Devil's Advocate on this issue. What *is* an appropriate response for Israel, who came under rocket attack attack, both by militants in Gaza and then later by militants in Lebanon? The immediate result is that Israel fired rockets back to the areas from where the original rockets were launched. Israel, in this case, is put at a disadvantage when the militants are firing rockets from within civilian areas, because what should be considered an appropriate response is deemed immoral because the militants are hiding among civilians. "In some of the strikes in Gaza it's pretty clear that phosphorus was used," Herby (from the International Committee of the Red Cross) told The Associated Press. "But it's not very unusual to use phosphorus to create smoke or illuminate a target. We have no evidence to suggest it's being used in any other way." Herby said that using phosphorus to illuminate a target or create smoke is legitimate under international law, and that there was no evidence the Jewish state was intentionally using phosphorus in a questionable way, such as burning down buildings or knowingly putting civilians at risk. No worries on advocating for the D-Man. What *is* an appropriate response is hotly debatable. Yes, the Israelis have lost 16 lives in the past several years to rocket attacks. In the two weeks since they've invaded Gaza, they've killed over 1000 people. Retribution complete, right? That's 62.5x in excess of an eye for an eye. Okay, so if these were all terrorists, no problem. Problem is they're not. Women, children, people who don't even agree with Hamas's tactics are being killed. This action is only serving to perpetuate this cycle of violence. A new generation of Palestinians are learning a hard first hand lesson in why their fathers hate Jews. Should Israel turn the other cheek? It hasn't proven successful for them in the past. These aren't easy questions to answer. But c'mon, the kids man? If militants are hiding in schools, Israeli commandos should be doing surgical strikes. Isn't Mossad the finest group of bad asses in the world? One thing that seems apparent from these conflicts is that Israeli responses are ridiculously lopsided, and they would rather sit back and bomb children then put their soldiers in harms way. The article you cite it from 1/14, the attacks I'm referring to occurred on the 15th. UNITED NATIONS (Reuters) - A warehouse in a U.N. compound in Gaza that came under Israeli fire on Thursday was apparently hit by white-phosphorus shells, U.N. humanitarian affairs chief John Holmes said. It was the first public allegation by a senior U.N. official echoing an accusation by Human Rights Watch last week that Israel had used white phosphorus, which can be used an incendiary weapon as well as making smoke screens or marking targets. Don't give any thought to the receptiveness of my typical blog readers. It's only a few of the vocal ones who typically disagree with you; I don't think they represent any significant majority. Anyhow, I got around to writing a post on this topic, so you're welcome to carry on this conversation over there. :) And as I said - I agree with you.